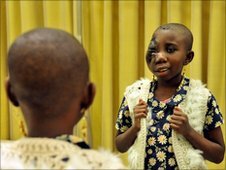 Born with a tumour that is fatally spreading across her face, a Ghanaian teenager puts her future in the hands of a London surgeon and the charity that brought her to the capital. "When Regina was a baby, she was looking very beautiful," says Stephen Addae about his daughter. His pride is understandable but Regina was born with a condition that set her apart from her younger sisters and put her at odds with her Ghanaian peers. The swelling on the left side of her face and around her eye is bulky in size. If left unchecked it will kill her. "It's called a congenital lymphangioma," says Dr Abi Boys, "in Regina it goes back toward the brain. It's quite incredible to see the dimensions of it." It's called a congenital lymphangioma. In Regina it goes back toward the brain. It's quite incredible to see the dimensions of it. Through her charity, Willing and Abel, Dr Boys has answered the Addae family's long search for help. For the last year Stephen and Regina have swapped the mountain tops of their homeland for the unfamiliar skyline of London - and a battery of tests to determine the scale of the challenges that lie ahead. Operating is not a guarantee. First, the doctors need to map what's inside the teenager's head. Scans have revealed how risky any procedure will be. The tumour's reaching toward Regina's brain and there's a battle to save her eye. "It's going to be difficult and a bit dangerous, too," confirms Professor Iain Hutchison before asking the teenager if she wants to go ahead. "I want to have my old face back," says Regina. "I want to be pretty again." "My heart was full of compassion." The face is a functional entity according to Dr Hutchison. We eat and speak through the mouth and breathe via the mouth and nose, with all our special senses located there. Regina's tumour is interfering with her breathing and preventing her from opening her mouth properly, making her condition more than its outward, physical appearance. In West Africa to have any kind of deformity carries a stigma and the assumption that the family has been cursed. But in north London one Ghanaian church is right behind the Addaes. "My heart was full of compassion to reach out and do something for Regina," says Grant Bulamo. The preacher's reaction was to support medical science with community prayer: "God is going to direct the surgeons," is his firm belief. Despite the risks and the complex surgery involved, the operation to help the teenager goes ahead. "There's no text book to tell me how to do this," warns Dr Hutchison. 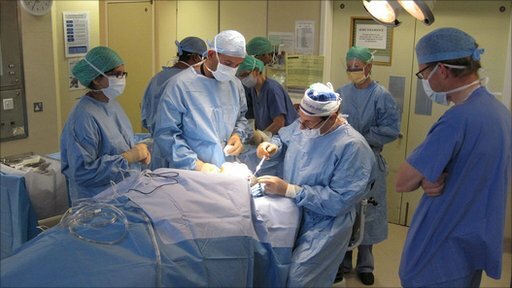 Over 12 hours he and his team apply years of experience to remove the tumour. Happily, the procedure is successful, with Dr Boys confirming that Regina had a dream that all was going to be fine. But to get a face the world will accept will take adjusting to - for the teenager and her family. "It's going to be an immense shock to them," says Dr Hutchison about Regina's new look and appearance. "They may, bizarrely, have a grief reaction because they've lost the child they've grown to love over the years." Regina's story is told in Inside Out London on Monday 6 December at 7.30pm on BBC One and is available afterwards on the BBC iPlayer.